The Prospect House and Civil War Museum is excited to introduce a new interactive Civil War learning experience for your students. The Civil War & Minnesota is an educational program that has been uniquely created for Minnesota 6th grade students and was developed upon Minnesota State Social Studies Standards regarding the Civil War and Reconstruction 1850-1877. Together we will discuss the causes of the war and major battles that were fought. We’ll look at the timeline of events leading up to and after war, and, of course, examine some actual Civil War artifacts! See and feel what it was like to be a Minnesota soldier during the Civil War. Put yourself in the shoes of civilians during this time and consider what life was like for them on the home front. Learn how the United States expanded westward and the difficult challenges it brought to the Native Americans and the many foreigners that came to Minnesota. Discover the history and growth of west central Minnesota. 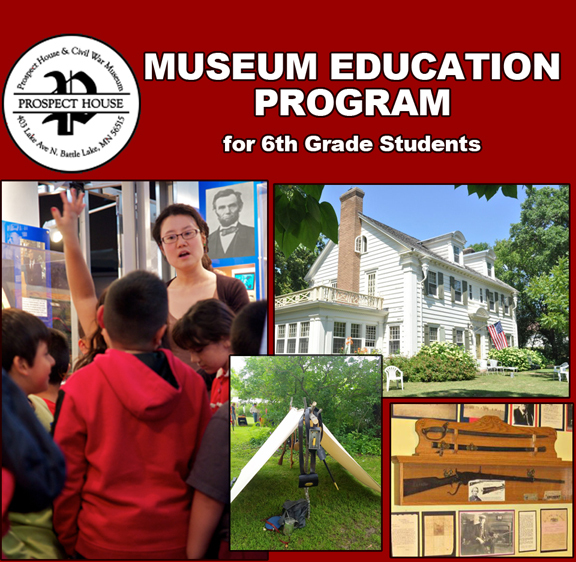 The Civil War & Minnesota educational program runs January through May. Costs are $5.00/students; $8.00/adults; the classroom teacher and two adult chaperones are free. Reserve your morning or afternoon tour time today, as dates are limited, by contacting Jay Johnson at 218-864-4008. Plant seeds of historical wonder and local heritage as you offer your students the unique opportunity to connect the past to the present! We look forward to seeing you at the museum! View School Letter in PDF format. The Prospect House, a Georgian-style "mansion," was the first house and later the first resort in Battle Lake, MN. James A. “Cap” Colehour, a veteran of the Civil War, migrated to Battle Lake, MN, and built the first house in town called the “Chicago House” in 1882. In 1886 Colehour built an addition onto his house and began to offer his home to visitors, which he then called "The Prospect Inn," as a seasonal resort hotel. He operated the resort until 1924 when he retired at age 82. Cap’s daughter, Kathrina, and her husband, Ernest Wilkins, remodeled the interior five years later in 1929. The house’s furnishings and décor have not been changed since that time. Continually inhabited by descendants of Cap Colehour since 1882, the four stories of Prospect House are filled with priceless artifacts, including a large exhibit room on the lower level dedicated to the Civil War. Historical markers around the yard tell the story of the Prospect House, which is on the State and National Register of Historic Places. The Prospect House and Civil War Museum is open year round. Call (218) 864-4008 for a tour appointment reservation. The Civil War Education curriculum development project was made possible by a grant from the Minnesota Historical Society, through the Arts and Cultural Heritage Fund by the vote of Minnesotans on November 4, 2008.